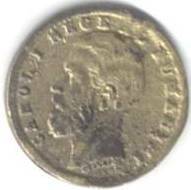 Although bearing the Romanian B (standing for Bucharest), the 1 ban coins from 1900 were stricken in Hamburg. Există o variantă cu litera R de la ROMANIA întreruptă. The 1883 and 1888 variants are rather theoretical. 500 hundred pieces were struck in each of these two years and gilt in order to be used as "mărţişoare" (March ensigns) by the royal family or to be given away as protocol by king Carol - the 1888 ones were covered in gold for sure, the others just doubtfully. An explanation is required. "Mărţişorul" is an adornment born on the chest on March 1st only - giving and wearing it is an entirely Romanian and a both ancient and living tradition of genuine Roman origin. It's not a Romanian custom only since the Bulgarians borrowed it in the past fifty years or so - thusly leading us to three implied countries in this spring welcoming custom, as the Republic of Moldova and Romania are as one, if not politically, at least in all matters concerning folklore, language and ancient heritage. 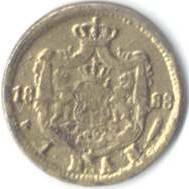 These March ensigns or garments, these "mărţişoare", differ from the 1900 coin type in their 5 bani like obverse (5 bani from 1882, 1883, 1884, 1885), i.e. mainly the lack of word Romania and the differently engraved coat of arms (winding tent braids, distinctness not restricted only to fringes though). The interest raised by these pieces is then to be accounted for their apart pattern. We personally do not consider that these pieces struck in 1883 and 1888, although numismatic, should deserve to be classified as coins. Let alone their small quantity, these pieces did never enter circulation. 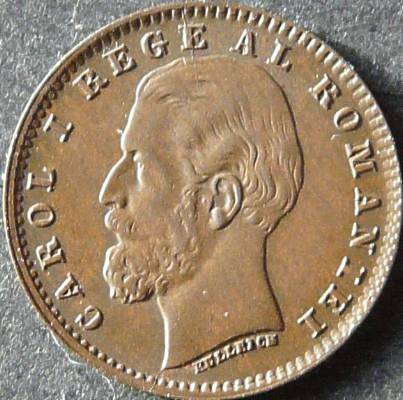 The 1900 coin on the other hand was struck in twenty million pieces. Currently there are to be found several fakes and replicas pretending authenticity of the 1883 and 1888 pieces. We do not advize their acquiring at all. 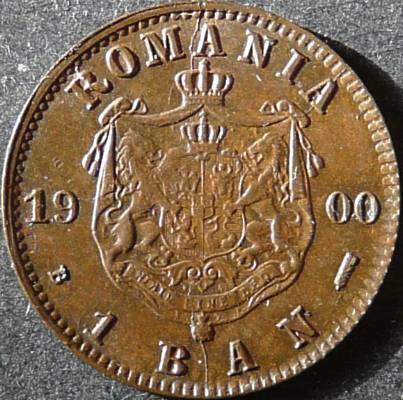 Above you can see the pictures of a rudimentary fake of the 1 ban piece of 1888, the pictures having been made available to Romanian coins by the kindness of Mr Adrian Popovici.